Instead of bringing us closer to God, and each other, the topic of financial giving is murky for most believers. The message is the result of my deep-dive study of roughly 2,000 gift mentions in the Bible. Plastic Donuts takes away the awkwardness that so often accompanies the subject of giving, and replaces it with biblical clarity. This simple message has traveled the world. 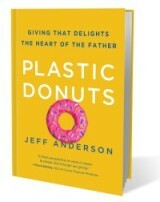 Pastors all across North America have shared the plastic donut illustration to teach on giving. Plastic Donuts brings everyone – leaders and followers, teachers and learners – onto the same page. You won’t see giving the same way after reading this book. Click here for free sermon guides, group resources, and more! I’ve known, and worked with, Jeff Anderson for nearly 10 years. He has lived his message which is solidly biblical, and helps people see their giving in a new light. The Acceptable Gift brings leaders and those they serve, on the same page and connected to God in their generosity. There are very few people that I’ve worked with that I feel like I can see the hand of God working through. It’s like their connected to God’s vision in a very intimate way. Jeff is one of these people. The church today desperately needs a fresh voice on the true meaning of biblical stewardship and Jeff Anderson is providing it! With an authentic life-message, Jeff speaks with powerful encouragement into the lives of individuals and entire congregations. He spoke into mine at a critical juncture and I am eternally grateful. Jeff Anderson is a longtime friend. He is highly qualified to share the principles and practicesof generosity with others because he personally lives them. Want to become more generous? Learn how from Acceptable Gift.